The language was bellicose, the atmosphere hostile. The statements, sometimes hypocritical. 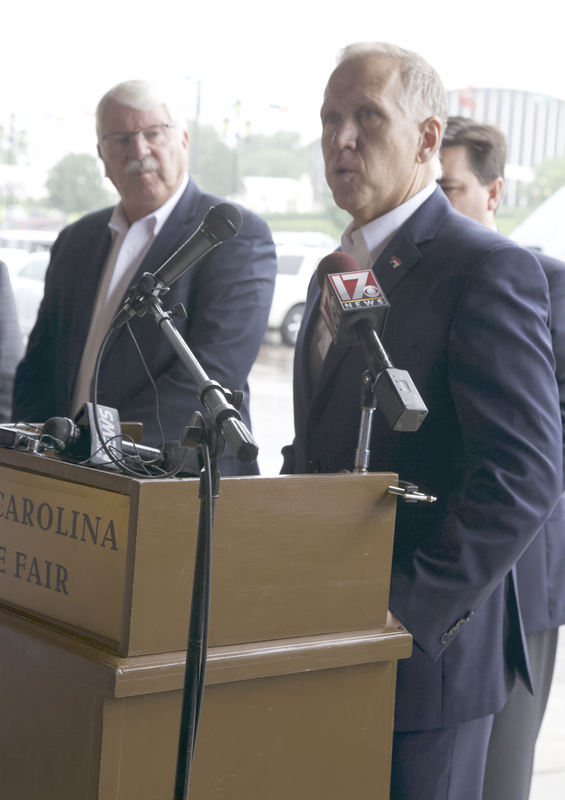 With less than 24 hours’ public notice, US Rep. David Rouzer convened a “National Agriculture Leaders Roundtable” at the state fairgrounds on Friday morning. To a room packed with contract swine growers, representatives from the USDA, farming interest groups and state elected officials — including several from out-of-state — blamed Smithfield’s continued legal defeats on the media, environmentalists, lawyers and “biased” US District Court Judge Earl Britt. The National Pork Producers Council, Prestage Farms and the NC Farm Bureau are also major contributors to Rouzer. It is true that the contract growers will be hurt as Smithfield Foods continues to lose nuisance lawsuits filed against it. But the world’s largest pork producer is not being forced to pull its pigs from these farms; it is choosing to, rather than address the nuisance caused by the open-pit waste lagoons and sprayfield systems. However, throughout the 90-minute venting session, roundtable participants lodged several allegations that were either not true or lacked context. Policy Watch factchecked the statements and is reporting their veracity here. Needs context: There is a gag order, but it does not apply to every hog farmer in North Carolina. In early July, US District Court Senior Judge Early Britt issued a gag order prohibiting people associated with cases — plaintiffs’ and defense attorneys, potential witnesses, and court personnel — from speaking with the media about any information that is not part of the public record. The intent, Britt said in his order, was to avoid tainting future jury pools with “extrajudicial” information. Misleading: Presumably trial lawyers do live in nice homes, and Michael Kaeske did own a mansion in Dallas, according Dallas magazine. However, Smithfield executives are paid even more handsomely. According to Securities and Exchange filings and company reports, Wan Long, the CEO of WH Group, the Chinese company that owns Smithfield, earned $291 million in salary and stock options last year. When C. Larry Pope retired in 2015, his payout was $25 million. He was ranked No. 86 on the Forbes list of wealthiest CEOs. In 2014, he was scheduled to earn a $46 million payout (see page 62) as part of the WH Group’s purchase of the company. Four other top executives were projected to receive a combined $54 million merger-related income. By comparison, many of Smithfield’s contract growers net less than $50,000 a year. False: A document from 1985 showed that three Duplin County neighbors did indeed complain about Carter’s expansion of his hog farm. The lagoon, the USDA report read, would be 850 feet from one home, and 1,500 feet from 11 others. One neighbor had planned to sell residential lots on land he owned; the lagoon would be adjacent to the acreage. The jury in the second trial didn’t see this document because it had not been produced via a public records request. The defense did have the document, though, but did not provide it until after the plaintiffs had rested their case. False: Laws define what constitutes a nuisance, including whether the activity in question aligns with the community’s character. In the city one dog that barks in the backyard might not constitute a nuisance; 30 dogs could, because that would be out of character for an urban area. According to the NC Law Review, a “plaintiff must demonstrate that (1) the defendant’s use of the property, under the circumstances, constituted an unreasonable invasion or interference with the plaintiff’s use or enjoyment of his property and (2) the plaintiff suffered substantial harm or injury as a result. If the plaintiffs have “moved to the nuisance,” as Duvall did when he relocated to Washington, DC, they might not have a case. However, here is where the law is open to interpretation. If existing homeowners live in an agricultural area home to a farm of 60 pasture-raised hogs, and then that farm expands to 7,500 hogs, with open-pit waste lagoons, sprayfields and attendant truck traffic, then those residents could have a case. Zippy Duvall: Farms will not be a nuisance to our Lord. National Pork Producers Council: These people have moved to the rural area. Needs context: Many of the neighbors have lived in the area before the farms arrived. Others have lived there while the farms expanded (see explanation above). Still others returned to family land — property they inherited or they already owned — after the farms had been established. Several witnesses who testified in the third lawsuit said the smell was horrific. However, they had purchased property after the farm, and they were not plaintiffs in the suit. Rep. Dixon: They’re not interested in improving our system. They would have filed for a perrmanent nuisance, but the didn’t. They filed for a temporary nuisance. Misleading: There are other reasons to file a lawsuit for temporary nuisance rather than a permanent one. First, the statute of limitations — three years — begins to run upon creation of the nuisance, according to USLegal.org. Some of these farms have been creating a nuisance for longer than three years, but only now are the cases going to trial. A nuisance is temporary if it is abated — stopped — and it is permanent if abatement is impracticable or impossible. The plaintiffs have charged that the nuisance — odors, flies and other problems associated with open-pit waste lagoons — can be stopped through advanced technology. There is a financial incentive for temporary nuisance suits. Permanent nuisances are those caused by a single act and damages are assessed once for all injury, USLegal.org explains. But if a continuing nuisance is alleged, then every continuation of the nuisance allows for a separate claim for damages. According to the Centers for Disease Control and Prevention, Missouri requires advanced waste-management systems and requires an odor management plan for farms with more than 7,000 hogs. Other states, including Oklahoma and Pennsylvania, require odor management plans for all CAFOs. Texas law requires these farms to have an air quality permit. Minnesota limits the amount of hydrogen sulfide that a farm can emit. North Carolina does not regulate these emissions from CAFOs. Bill Northey, USDA Undersecretary of Farm Production and Conservation: The threat of lawsuits will turn away young people from farming. Needs context: According to the Washington Post, The number of farmers age 25 to 34 grew 2.2 percent between 2007 and 2012, according to the 2014 USDA census, and many of them are going into sustainable and organic agriculture. In some states, such as California, Nebraska and South Dakota, the number of beginning farmers has grown by 20 percent or more. The greater challenge is access to land. The same article reported that between 1992 and 2012, the country lost more than 250,000 midsize and small commercial farms, according to the USDA. During that same period, more than 35,000 very large farms started up, and the large farms already in existence consolidated their acreage. Needs context: “Cost-effective” is a relative term. The cost to install a lagoon cover is about $250,000; the covers last about 10 years. And it is true that installing a cover changes the entire waste management structure of a farm, including the sludge application rate because of additional nitrogen that can build up. Converting to a cover would help offset the cost of closing a lagoon, which is roughly $43,000 an acre, according to NC State University. And converting the methane to energy can also offset some of the operational costs. Successful Farming magazine detailed how Smithfield “save the worst hog farm in America,” in Missouri, through covered lagoons and biogas. The company’s profits have increased and the herds are healthier. Needs context: In the 1800s, the Republic of Texas waged war on the Comanche, who were there first. After thousands of its members were slaughtered, the tribe surrendered and was relocated to a reservation in Oklahoma. Inconclusive: There is no mention of hog farming in the Book of Genesis. These politicians are playing a dangerous game, undermining the integrity of our judicial system and parading their preference for agribusiness over real farmers and ordinary people. These same politicians have turned a deaf ear to the valid concerns and complaints of residents, cut funding for executive branch agencies that had some authority to regulate the industry, and now have the audacity to complain when those residents sought relief from the only branch of civil society that remained open to them? It’s outrageous. I am completely embarrassed by our “leadership” in NC. They had a chance to create a win-win solution, and so far have failed miserably. They are not representing the people, they are in it for themselves, and do not want to give up the money they get from big pork. These lawsuits, like Trump’s victory in Washington, are exposing NC’s dirty little secrets. These guys finally got some power, and they have no idea what to do with it! I would say they are incompetent, but that only applies to some. Others know exactly what they’re doing…..protecting their money pipeline!